You are participating in the first-of-its-kind trail running marathon on Vitosha. You are going to compete against a bunch of trained and skilled runners in running through a square area of the mountain. The uniqueness of this marathon is that each runner can choose his own route. You studied carefully this matter and it turns out that altitude is the main thing to consider. You have an altitude map of the area, represented by a square matrix. Each cell of the matrix contains the altitude of that part of the terrain. When you are in a given cell, you can run to any of the 8 adjacent cells and this will take one minute + the absolute difference in altitudes between the current cell and the cell you are going to, counted as minutes. You want to know what is the minimal time in which you can complete the track. Input: The first line of the input will contain N – the number size of the map. The second line will contain 4 integers RowStart,ColumnStart and RowFinish, ColumnFinish – the zero-based coordinates of the start and the finish on the map. The next N lines will each contain N integers representing the altitude of the corresponding cell in the map. Output: Output the minimal possible time in which you can run from the start to the finish. So, if you take a look at the drawing below (it is a masterpiece, I know), on the top right you will see the matrix I am talking about. In it, you will notice that the way from a to b is 2 abs(1-2)+1 and the way from f to b is 5 abs(6-2)+1. Once, I had something like this in code, probably half of the work would be considered done. Then I would have a simple matrix with positive weights, which is exactly what the Dijkstra algorithm needs. Pretty much it is the same as the one above, initially drawn by me, but it is even mirrored (e.g. you can reach a from b for the same weight as b from a). So, after having the weights the task was a little easier. 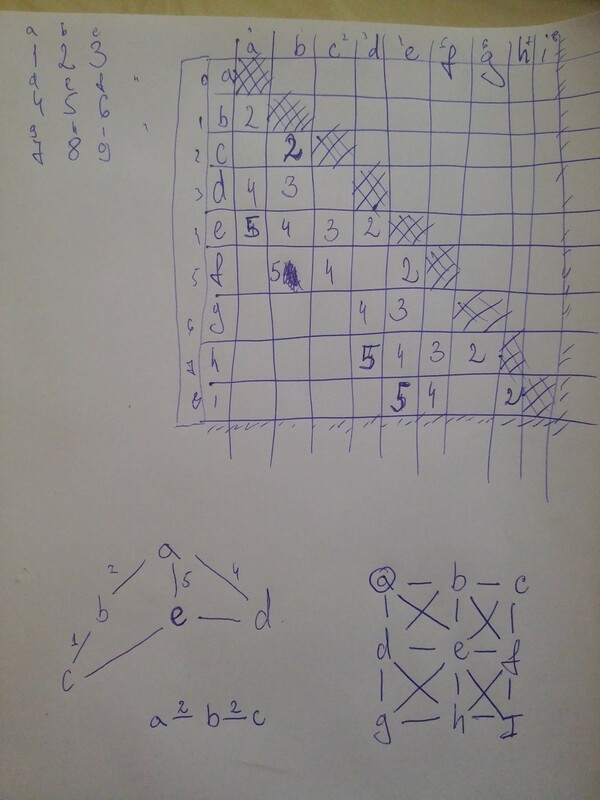 I had to implement Dijkstra, and although I have done it a few times already and I had the code in front of me, I had some difficulties. Anyway, I have managed to get over them and the results was stunning (at least for me).